Sometimes it feels like I live at Whole Foods. Well maybe not exactly live, but spend a lot of time there. The Whole Foods at Bowery and Houston is the closest good grocery store to where I live and is also on my path to both yoga and the Union Square farmers market and it seems not a day doesn’t go by when I don’t stop to get something I need and more often than not a few things I don’t need. Over the years I ‘ve notice that Whole Foods has stopped carrying some brands that I like to replace them with their brand. Cereal and Bread are the two things I used to buy their that now I can’t because they no longer carry what I want. However, I have to say that unlike the unfair nick name Whole Paycheck I find that Whole Foods organic 365 brand is a bargain. Cheapest olive oil in town, great tortilla chips and salsa, butter, eggs all of high quality and really well priced. It certainly is cheaper to shop at Whole Foods than the Fine Fare (Ghetto Grocers as I fondly call it) across the street from our apartment. Whole Foods is also dedicated to carrying local products, mostly produce but other stuff like chocolate, juice and miscellaneous other things as well. 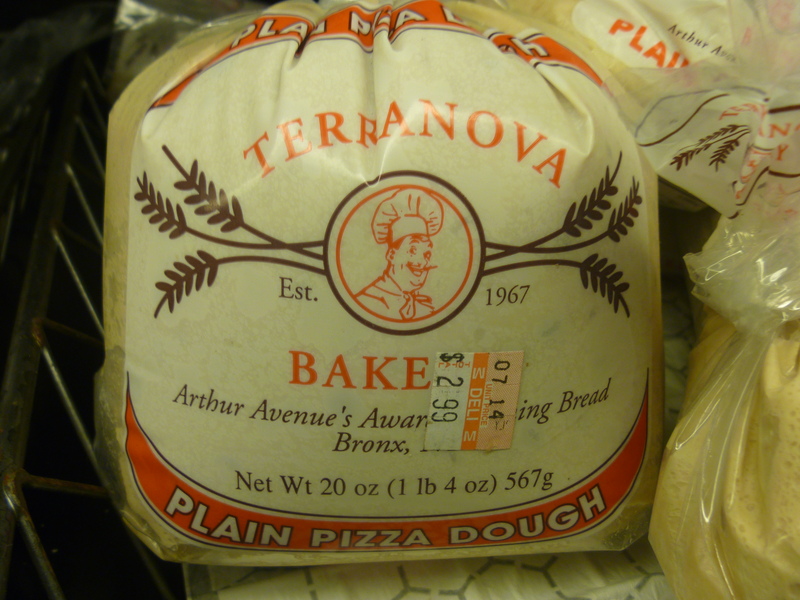 What surprised me the other day was not only did they have in stock Terranova Fresh Pizza dough from a bakery on Arthur Ave (Arthur Avenue is the main street of the old Italian neighbourhood in the Bronx and is certainly much more authentically Italian then the touristy t-shirt filled Little Italy in Manhattan). And even though I make my own pizza dough I thought this was a great, local New York item to carry. 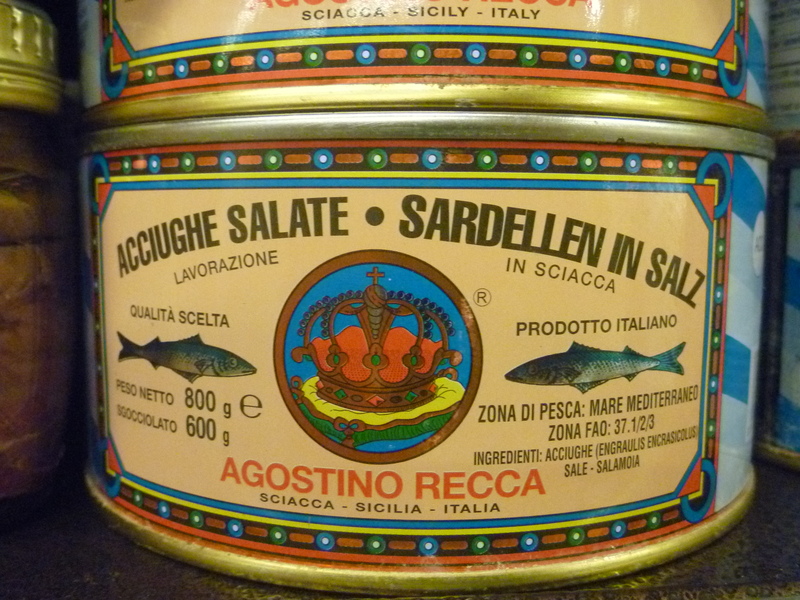 Then a few aisles over I notice as I’m about to throw a few tins of flat anchovy fillets in oil into my cart a big can of salted anchovies! A few years back when I went looking for salted anchovies I had to go to Buon Italia to find them and other than Arthur Avenue I can’t find them anywhere in Manhattan and now here they are in Whole Foods? And at 21.95 a tin they aren’t exactly a deal (they are 15.35 at http://www.buonitalia.com/ ) but they are closer than Chelsea and in this heat to have them available at the store you walk by on your way home – is a good thing. You never know when you might have an urgent need for some salted anchovies to go on your pizza that you’ll make with the pre made dough you just bought. This entry was posted in NYC, Other Stuff and tagged arthur avenue bronx, fine fare, little italy, pre made pizza dough, salted anchovy, whole foods. Bookmark the permalink.